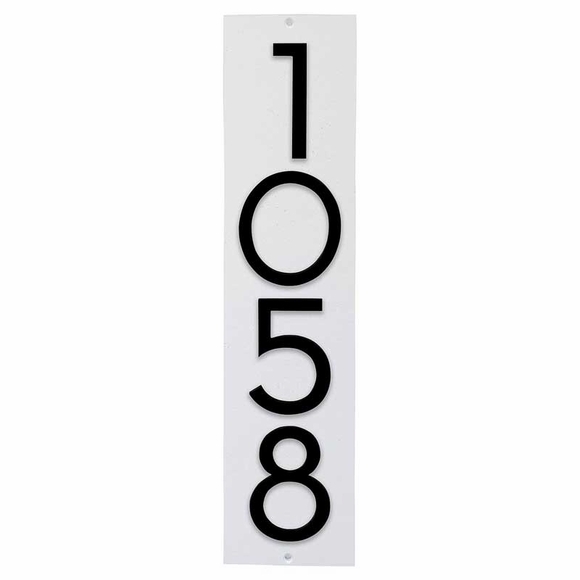 Address Plaque with 4 Offset Numbers - - holds four bold 3" or 4" dimensional characters. Suitable for an address number with 4 digits, such as 4444 Rounder Road. Horizontal or vertical orientation. Made in USA. Includes four raised floating solid cast aluminum numbers on a 1/4" thick solid aluminum backplate with either a horizontal orientation or vertical orientation. The numbers are securely fastened to the plaque on the back side with screws that are countersunk to conceal them, as shown in the small image on the far right. with 3" numbers: 4.5"H x 12.375"W x 1" thick. with 4" numbers: 6"H x 16.5"W x 1" thick. with 3" numbers: 14.25"H x 3.375"W x 1"thick. with 4" numbers: 19"H x 4.5"W x 1" thick. Address Plaque with 4 Offset Numbers holds four 3" or 4" dimensional characters. Made in USA. Our newest ultra chic address plaque is a high quality, contemporary custom sign at an affordable price. Exactly what I was expecting, I had to do some modifications to make it exactly what I wanted, however this is not an issue with Comfort House or its product, that was perfect. It had more to do with being a perfectionist, and the result of customizing the install, if you had a section for pix I would post the results.